Dinosaur Attraction at Tokyo DisneySea? [Rumor] Dinosaur Attraction at Tokyo DisneySea? I was recently at the D23 expo in Anaheim. 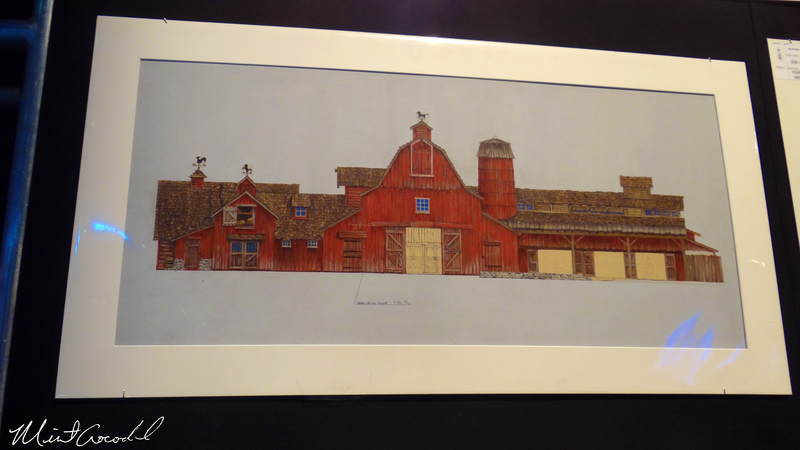 While touring the Imagineering Pavillion I noticed a piece of concept art (well, not really, it was a color study for a building) I didn't recognize. It was a red barn. Very beautiful and something you might find in an idealized small town. I asked the man standing next to it what it was and he said it was for the dinosaur attraction at Tokyo Disneyland. I knew there wasn't a dinosaur attraction there and just shrugged and moved on. Yesterday, I was reading the latest TDL trip report and there was a photo which the author thought might be an allusion to an upcoming dinosaur attraction. It was in the American waterfront section of DisneySea...near Cape Cod, the pefect place for the barn. This got me thinking: is this a known project? Or something that was scrapped? I've never heard of it before. Re: Dinosaur Attraction at Tokyo DisneySea? There is already a dinosaur in Disneyland and its westernland railroad endsing there then you will see some of it. After very limited research, it sounds like "Chester and Hester's Dinosaur Treasures" in Dinoland, USA at Animal Kingdom. I'm confused about why that would be coming to TDR, and even more confused about why it would be in Cape Cod (except that obviously the barn fits perfectly). I'm not sure what to make of this news. UbIwerks, you mentioned that it was for TDL, but then said it would be in TDS. When you said "Tokyo Disneyland" did you mean "Tokyo Disney RESORT?" I think Dsfa10 is on to the real answer. There is no "Dinosaur" attraction coming, or planned for either park. What that red barn is, is part of the "Western River Railroad" at Tokyo Disneyland. The "Dinosaur" part of the imagineer's response, is that they have the "Primeval World Diorama" as part of that attraction, so that's what he meant. Is this the barn you saw? If so, it's part of the scenery along the tracks. ^^^This was my though as well. 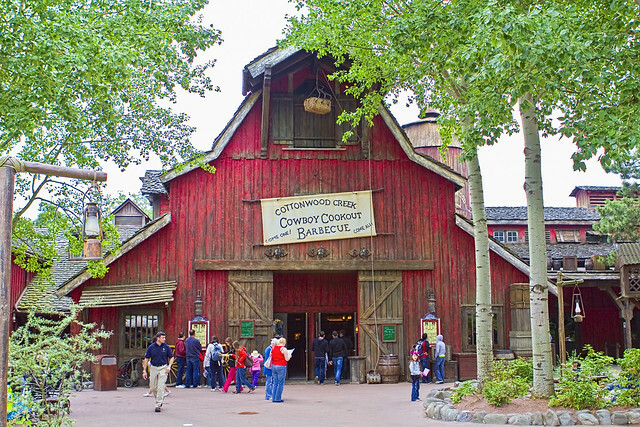 It is the existing Cottonwood Creek BBQ at DLP. Got to wonder what the guy was thinking who told you it was a Dinosaur ride for Tokyo and if he drives a WDW bus. That's it! I was so confused. What's hilarious is I've been to Disneyland Paris and eaten at that restaurant (meh). In my mind I thought it might be that, but wasn't sure. That's why I asked. He clearly said "that is for the dinosaur attraction at Tokyo Disneyland (Resort implied, I suppose)" Mystery solved! I'm glad that got all cleared up. I was reeeally worried about "jumping the shark" if Cape Cod was about to become overrun with dinosaurs...:lmao: That barn sure is pertty, though! LOL, yeah, not even close! I do love that barn, and it's a pretty different thing for any of the Frontierlands. I think it looks great...but why did he say it's for TDR? That "barn" is the Stillwater Junction station on the Western River railroad. There is an incredible amount of detail in it which you can spot on repeated rides if the train is going slowly enough. The dinosaur attraction at the end of Western River Railroad is called Primeval World, and is identical (though slightly better executed) to the one at Disneyland in California, which was brought back from the Ford Magic Skyway at the World's Fair. Western River Railroad is best ridden at night, particularly a rainy night. You would swear you were deep in the Jungle. Yes, the Primeval World on the WRR is very, very similar to the original, but it should be noted that the attraction does not feature Disneyland's football field long Grand Canyon portion of the diorama. Coincidentally, still on the subject of avoiding "bad show," Stillwater Junction is a nice piece of eye candy, but it's also a bit of slight of hand. That spot is the only backstage cast crossing point on the WRR tracks. The many cast with work locations in that portion of the park use it when they go to and from Wardrobe (now called the wardrobe "Annex" after the larger one located between the parks was opened in 2001). Stillwater Junction was added in September of 1990, not only to provide some good show after a long stretch of track with little to look at, but lessen the chances of bad show. It create a distraction for guests, giving cast who have become distracted themselves a chance hide from guest view. (Hey, what's that guy in the Hawaiian shirt doing here in the old west?!) As you pass by Stillwater Junction, odds are there are cast hiding just out of sight behind the trees on either side of the track, waiting for your train to pass so they can continue on their way. Last edited by Resort Cruiser; 08-25-2013, 05:14 AM.